The Threshold is a collection of artificial impulse responses designed for the sole purpose of obliterating sound and creating droning washes of ambient texture. Abstract, harsh, luscious and dark fantasy IRs will warp, wash, drone, drown and push your sounds beyond the pale. 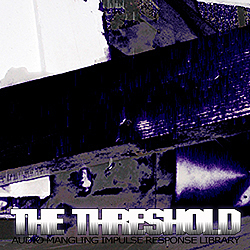 The Threshold is not a normal reverb IR set, but a sound mangling tool geared towards creating atmospheric soundscapes. With some creative thinking, this collection has limitless possibilities: add density to sound without affecting mix clarity, create unique layered effects on solo instruments, add bizarre new textures and reverse effects to percussion, and much more. What a delightful and interesting set of IRs! Are these created by the same person who did the Spectral Relativity CD (Spirit Canyon Audio)? Close. Same author who created the Sanitarium collection available from Spirit Canyon Audio. Glad you like the set! Thanks. I’ve now purchased the Sanitarium set as well! I’d been missing out. Just have to say thanks again. What happened to Spirit Canyon Audio? Thanks so much for creating and sharing these! Thanks for the library. Checking it out as soon as the download is done. I’d also love to know what happened to Spirit Canyon. I bought one of their IR libraries back in 2007 and it was one of the best things I ever invested in. Second only to Reaktor in terms of creativity/productivity for me.